Thanks to Harlequin here is your chance to win one of 3 x Summer Reading Packs valued at $89.97, each. Each pack includes a copy of Where the Murray River Runs, Moment of Truth and Child of Africa. A nineteenth-century story of greed, honour and an overwhelming love. Bendigo 1890: Ard O'Rourke is Linley Seymour's perfect man. They've known each other since they were children and she has never wanted anyone else. But when she discovers Ard has fathered a child with another woman, her dreams turn to dust. Then fate takes a hand. Linley and her Aunt Cee Cee run a women's refuge and Linley finds herself unexpectedly and painfully the guardian of Ard's baby: a child that needs her protection from the greed-filled schemes of a violent man. Will he prevail? Can Linley find it in her heart to forgive him? Or will their love come to nothing at the hands of a violent man? A compulsively readable historical adventure, set on the banks of the mighty Murray River. Darry Fraser spent part of her childhood on the mighty Murray river, but lives and works on a beautiful island off the coast of South Australia. She loves to write and has self-published nine contemporary romance eBooks. She is a member of the RWA. Alexis Brown was thirteen when her parents were killed. The police labelled it a murder-suicide, but Alexis has grown up believing her loving father could never have hurt her mother. Seventeen years later, Alexis receives an anonymous note telling her the police were wrong and her parents were both murdered, she's determined to return to Blue Ridge and find out the truth. 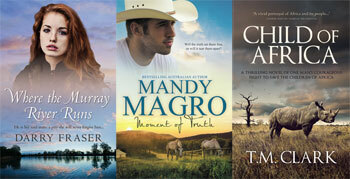 Mandy's brand of rural romance mixes sweet romance between characters connected by fate, set in the heart of the Australian countryside. Mandy Magro lives in Cairns, with pristine aqua-blue coastline in one direction and sweeping rural landscapes in the other. A passionate woman and a romantic at heart, she loves writing about soul-deep love, the Australian rural way of life and all the wonderful characters that live there. With fast-paced action and a vivid African setting, Australian author T.M. Clark returns with a suspenseful new thriller set in her birth country, Zimbabwe. After returning from Afghanistan, ex-British marine Joss Brennan embraces living as a double amputee, but he finds life at his safari lodge near Lake Kariba, Zimbabwe, not quite as idyllic as when he left. Peta de Longe is a big game veterinarian and no stranger to hard decisions. Working in the messy political society of Zimbabwe, she's engaged in a constant struggle to save the national parks. When she nearly drives over Joss, the reunion isn't joyous –But once she uncovers the terrible ordeal that Joss has gone through, can she learn to forgive and move forward? When a corrupt and dangerous businessman with close ties to government threatens all he holds dear, Joss realises he doesn't need to save strangers in a faraway land. But will he fight to save his own country and the people he considers his family? Born in Zimbabwe, T.M. Clark completed her primary school years at boarding school in Bulawayo, but on weekends and holidays she explored their family ranch in Nyamandhlovu. Her teenage years were totally different to her idyllic childhood. After her father died, the family of five women moved to Kokstad, a rural town at the foot of the Drakensberg Mountains in South Africa, and the boarding school hostel became her home. She began writing fiction in the UK while a stay-at-home mum to her two sons and she hasn't looked back. Now living on a small island near Brisbane in Queensland, Australia, T.M. Clark combines her passion for storytelling with her love for Africa.